Business video content is thriving more than ever before, and long-form copy is rapidly giving way to the 30-second script. With massive studies done by the likes of Wistia, YouTube, and Ooyala on video engagement, and with video projected to take up over 90 percent of the online content pie within the next decade, it’s hardly surprising that businesses are scrambling to keep up with the expectations set by YouTube celebrities and Viners. A good way to assess the pervasiveness of online video content is to look at its projected growth. 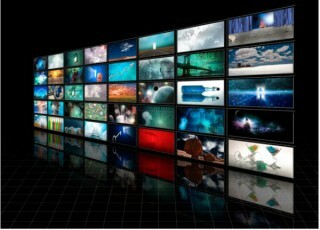 According to a comprehensive 2011 white paper by YuMe, 48 percent of online viewers expected to watch more online video and less TV in 2012. Even if you don’t entirely understand what’s going on in this chart, it’s easy to see that projections for online video content are high, and declines are nearly nonexistent. 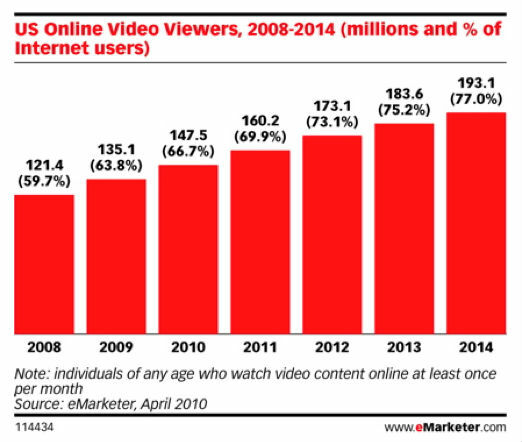 eMarketer also did a 2010 study that projected the total number of U.S. online video viewers from 2008 to 2014. Notice that these projections only took into account viewers that watch video content once a month, and that the projected increase from 2010 to 2012 was only 5.4 percent. As it turns out, over 100 million Americans were watching online video once a day by 2012. By 2013, over half of all online content had become video, and by 2016 the number is expected to jump to 86 percent — just a few percentage points shy of YouTube’s 2012 prediction. But the biggest sign of online video’s explosive growth is Cisco’s projected 1.5 billion daily online video viewers in 2016, which would be 15 times as much as the current number in 2013. Clearly, businesses need to start making engaging brand videos in order to give their content a much needed lift and to stay competitive. When it comes down to it, if you’re not making video in 2013, you’re not marketing. But that’s not to say that businesses should just pour their resources into a specific type of business video (like 30-second promos with viral ambitions). There are many different types of business video content, and each can be used to target a specific subset of consumers in an engaging way. Short for “video blog,” vlogs have been made popular by famous YouTube celebrities like Jenna Marbles (comedy), Michelle Phan (beauty tips), and Tobuscus (gaming). Each of these three celebs boasts several million views per video. Vlogs are typically 1–5 minutes in length and can be about anything — unlike webinars, which are more thematic in nature. While many small businesses have embraced the webinar model, not many big businesses have embraced vlogs. The few that have are tech companies, and the only one to do it exceptionally well (for now) is Gamespot. 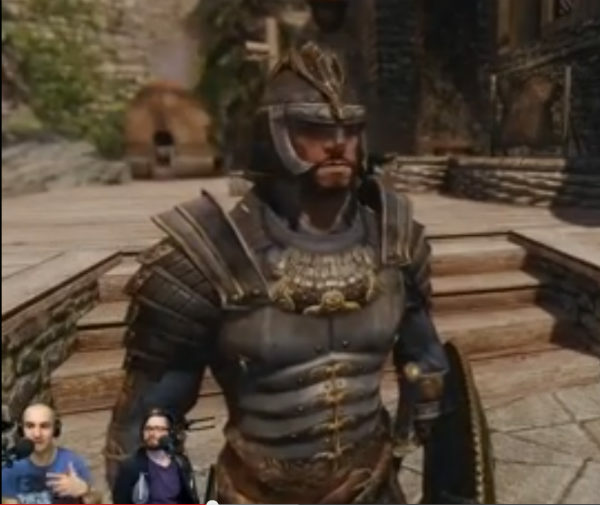 The company does several regular vlogs, including one on the five best mods of the week for Skyrim. Takeaway: Vlogs are different from webinars because they don’t need to be about business commentary or best practices, and they don’t need to follow a script — they can be about anything, and are limited only by a content marketer’s creativity and a speaker’s dynamism. Vlogs also don’t have to be high-production in order to be engaging. Six seconds is very short, but also very reliable — the completion rate of a 6-second video is practically 100 percent. That’s exactly why Vines have become so appealing to big business. Dozens of big brands have already tried their hand at mastering this new, bite-sized form of content. Coca-Cola and Red Vines are using 6-second videos to try and convince moviegoers to buy licorice and soda; Lowes is making quick DIY videos; and MailChimp is familiarizing everyone with its mascot. 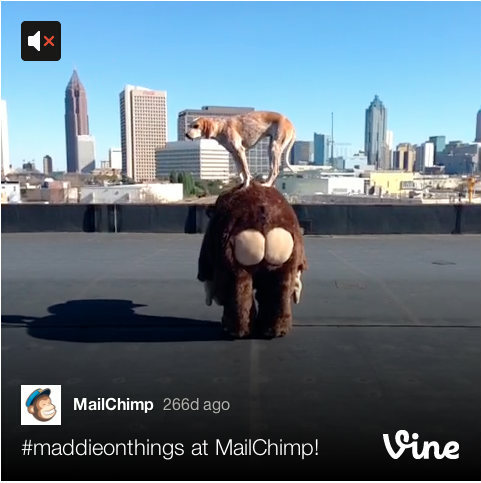 While most companies have only been using Vines for quick laughs, a few have elevated the art form to new and clever heights. Take this Vine by Simon & Schuster, for example. The publishing company managed to fit a whole month’s bestseller catalog into a 6-second flipbook. Pretty neat. Takeaway: Is shorter video better for business? The simple answer is yes — shorter video content sees much better engagement than longer video (i.e. >5 min.). But even 30-second videos suffer from over 20 percent viewer drop-off by video’s end — that’s why Twitter decided to up the ante with Vine’s 6-second limit. That one extra second above 5 seconds gives you just enough time to make an elemental story and still retain 100 percent completion. An event video is a powerful marketing tool (especially when it doesn’t contain a script) because it’s inherently more trustworthy than a well-written promo. While no product is being marketed, per sé, well-made event video content that highlights the best parts of a given evening can convey a depth of information about your company, product, and culture that is unrivaled by practically any other type of business video. Takeaway: Event videos are like the black sheep of business video because they don’t require scripts. While this might seem counterintuitive (and almost like a waste of money), take a moment to think about the complex, knee-jerk decisions you make as you try to decide whether to wander into a new restaurant, for example. Sometimes, actions and imagery both speak louder than words. There are so many possibilities when it comes to interview videos. Lead creatives can be interviewed about the vision for a new project; employees can make slice-of-life recruiting videos that showcase a culture of camaraderie, or your company could host an interview webinar that interviews industry experts via Skype. Perhaps the best type of interview video, though, is the type that remains the most undervalued and underappreciated — the recruitment video. It never ceases to amaze me how many companies don’t have a relevant video in their About Us section or on their Careers page. And guess what? Your HR team can always use another recruiting tool at its disposal. These insider peeks at company life, work, and play aren’t just for potential employees, either. Slice-of-life interview videos are a fantastic way to invite your viewers into the office for a quick tour of the people and places making their products. 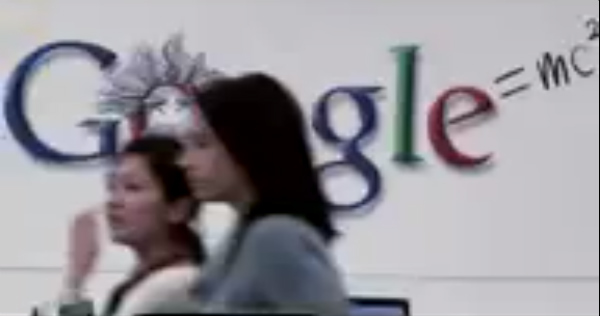 Google is one of the biggest companies in the world — as well as one of the most well-respected. That doesn’t stop it from putting out “Inside Look” videos, though, to give audiences more intimate familiarity with the company, its products, and what it stands for. Google understands that no matter how good your brand reputation, there’s nothing like seeing when it comes to believing. Takeaway: Interviews are genuine, spontaneous, and believable. They force interviewees to dig deep and really think about what makes them tick from day to day, as well as why they’re passionate about their work. This unearths the type of genuine dialogue that viewers respond to enthusiastically. Presentations shouldn’t be limited to boardrooms and PowerPoint meetings. A well-prepared presentation by a charismatic, engaging speaker is a special type of speech that carries a lot of purchasing power with it. Ever watched a TED Talk? When you think about it, TED could just interview all of its speakers and then upload the videos to YouTube; but instead TED makes sure that each of its presenters has a live audience for a full 20 minutes. When viewers see the engagement on the part of the live audience, they’re hardwired by group-think to feel more favorably toward the presenter, too. The TED model can and has been applied to big business presentations as well, most famously by the late Steve Jobs. Takeaway: A golden rule of content marketing is to think beyond direct response and focus on top-of-the-funnel customer engagement. If you want to distinguish yourself as a thought leader, presentations are the best video content tool in your arsenal. Have you found success in creating any of these types of videos for your business? Are there others you would recommend? Let us know your thoughts in the comments. Looking for more ways to maximize the impact of your video content? Get practical insights, advice, and answers in our 2018 Guide to Essential Content Marketing Tactics. Justin Park is a co-founder of Vidaao, a video production marketplace that connects marketing teams with creatives and provides them a collaborative project space. Justin previously ran a video production company. Follow Vidaao on Facebook, and Twitter.